Kyle Katarn is creating stop-motion animation! The past two years of YouTube have been a ton of fun, and now it's time to take the channel to the next level. Supporting Kyle Katarn on Patreon helps him with equipment upgrades and resources to create better, more elaborate videos like custom helmet tutorials, stop motion animated shorts, and live streams with the audience! There's advantages to supporting Kyle on Patreon beyond improving his content; Patrons can vote in exclusive content polls and choose what videos Kyle should make next, access to full length unedited reactions, and even opportunities to voice a character in an upcoming stop motion animated short! You can check out Kyle's Animation Reel here! I want to start recording as many gameplay videos as I can, not just of Battlefront II but of all classic star wars games from TIE Fighter all the way to Jedi Academy. My current PC build cannot support that but with the help of Patreon supporters I can upgrade and create better content. You're officially in the gang. Becoming a patron gets you access to exclusive Kyle Katarn videos, as well as full unedited reactions to all episodes of Star Wars Resistance, and access to the Content Poll which gives Patrons a chance to vote on what Kyle and Bendu react to next! Most generous! We will watch your career with great interest. Becoming a patron gets you access to exclusive Kyle Katarn videos, as well as unedited reactions to all upcoming episodes of Star Wars Resistance, The Mandalorian, etc, and your name will be featured in the next Kyle Katarn video! You also gain access to the Content Poll which gives Patrons a chance to vote on what Kyle and Bendu react to next! When the stop-motion animation project goes live, you will be offered a voice acting role! I'm really not expecting anyone to donate this much money. If they do it will be a surprise, to be sure, but a welcome one. Becoming a patron gets you access to exclusive Kyle Katarn videos, as well as unedited reactions to all upcoming episodes of Star Wars Resistance, and access to the Content Poll which gives Patrons a chance to vote on what Kyle and Bendu react to next! 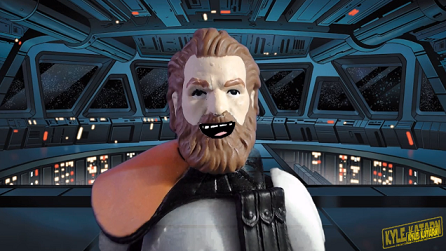 When my stop-motion animation project gets off the ground, you will be offered a voice acting role, and will receive a personalized shoutout at the end of the next Kyle Katarn video. Hell, for that kinda money you could request personalized content. My current PC build cannot support streaming or live gameplay, or high resolution game captures. Once I upgrade my PC build I'll do livestreams on YouTube and Patreon, but I'm also gonna launch a whole new section of the channel, where I play classic Star Wars games and either record or stream the gameplay. Patrons can choose which games I start with!